At this point, the idea of spring seems like a fairy tale! Even though it’s only officially a day away on the calendar, the snow here in rural Ontario, Canada is still over a foot deep. Whether you are welcoming spring or fall, I hope you and your family are doing well, busily living and learning. Even if “busily” happen to look pretty chill for some of you at the moment. This month’s topic was inspired by various comments I’ve heard over the years. I don’t mean that they were negative or meant to belittle what we do, but they did shine a light on what our unschooling lifestyle can look like to others peering in. Unschoolers can really be a confusing bunch to those looking in! On one hand, we appear to be sheltering our children from the real world by keeping them home-we’re overprotective. On the other hand, we appear to not really care about our children because we don’t enforce firm rules. Conventionally, it’s almost a given that at some point parents will explain to their kids, “I say no because I love you.” Boundaries equal love. What if freedom can equal love too? I used piercing as a passing example in my last blog post, which lead me to search out a relatively recent post about piercings that was tickling my brain. I found it! It was on Jennifer McGrail’s blog, The Path Less Taken, and you can read it here:Piercings and Perceptions. Backstory: Her daughter wanted to get her ears pierced and Jen chose a reputable tattoo/piercing shop, where they had a great experience. Soon after she came across an article about taking your child to a tattoo/piercing shop rather than the mall to get their ears pierced, and was inspired to write this post by some of the comments she read from parents who think the people that work at those shops look scary and they don’t want their children to have nightmares. I think it’s a great point to remember as we talk about what unschooling can look like from the outside—meaning how it can be perceived by people unfamiliar with the lifestyle. In the posts so far this month I’ve talked about some perceptions others may take from our actions and why those perceptions are reasonably understandable, given their perspective. Unschooling can look very different from a conventional lifestyle. And different can be scary. But our unschooling reality, our perspective from the inside, gives us a much different take on the situation. I decided somewhere along the way that I wanted something different for my own kids. That I didn’t want them to see people for their clothes or their hairstyles or their body modifications, but for who they are as people. I want them to assume, first and foremost, that most people are good. That most people are kind. That most people will treat them as respectfully as they’re treated in kind, no matter what their outer packaging looks like. I think many unschoolers are predisposed to this outlook because we ourselves are making unconventional choices. And we’re generally pretty nice people, I think. So if our actions are being misinterpreted by others, it’s not a big stretch to think that’s happening to other people too. Our packaging—what most people see when they get a short glimpse of us—does not often tell the real story. Jen has two thoughts for parents who find it challenging to move past “different,” who don’t want to expose their children to “scary” people. First, some of the nicest people I have ever met have been at tattoo shops. Truly. I’ve only had wonderful experiences at every single one of the shops I’ve gone to. My theory is that the artists who are tattooing and piercing are following a passion … people who follow their passions are happy … and happy people are nice people. Let down your guard, and let yourself see it. I want to second that! I remember when Lissy wanted to get her lip pierced and she researched local shops. She settled on one (our nearby town has four tattoo/piercing shops within a five minute walk of each other!) and it crossed my mind that we’d driven by it regularly for years and each time I noticed it, to me it looked entirely exotic and … different. I wondered what it was like inside. I was a bit nervous about what we might find when we went for her appointment, but I was determined to be open to the experience. The people that worked there were just that: people. Nice people. Engaged people because they were doing what they loved in an atmosphere that celebrated their passion. We’ve been in there many times since and have had a great experience every visit. Really nice people. Same with the alternative music shows at local night clubs Lissy enjoyed for years, starting around age thirteen. Same with Michael’s immersion in karate and MMA and stunt fighting. None of these were communities I was familiar with. And because they were unfamiliar, they were a bit scary at first. Mosh pits? Weapons? But my children were interested so I went with an open mind and heart and yet again, we found such nice people! It doesn’t surprise me any more. In communities where people are choosing to be there and are passionate about the activity, no matter how unconventional it looks from the outside, I have found really nice people. Different doesn’t need to be scary. And second, kids take their cues from their parents more than from anyone else. If we continue to avoid people who are “different”, they will continue to believe that “different” is scary. If we stay far away from the guy with the long dreadlocks, scoff at the guy with the coaster-sized gauged ears, and silently judge the girl with tattoos all over her neck, our kids will learn from our example. It starts with us. Especially with unschooling, we are choosing to be our children’s close companion as they explore and learn about the world. We aren’t knowledgeable and experienced with everything they might find interesting. But we can be open to it. We can talk about how new and different experiences may be uncomfortable at first, but that that doesn’t need to stop us. Together, you and your child can discover that, most often, different people are nice people too. Last week Michael and I were invited to visit a film set by the person he trains with for extreme performance martial arts and stunt fighting. Michael’s been training with him for about a year now and really enjoys it! Not to mention, his flipping and fighting skills have been developing very well. It was a wonderful day! We stayed until they wrapped at 9pm and had a such great time just soaking it all in, from wire stunts, to fight choreography, to fake blood spurts. Driving home we figured we saw them shoot about 10 seconds of actual movie time, if that. But not only was it interesting and inspiring, Michael now has a much more concrete idea of what a day in the life of a stunt person looks like and he’s as keen as ever. I’ve been sorting, resorting, and sorting again my blog posts from the last year and a half for a compilation book. It’s changed a bit yet again, but not drastically. As has the title, but as of this moment it’s Life Through the Lens of Unschooling: A Living Joyfully Companion. Right now my lovely editor, Alex, has the last couple of chapters, and the cover designer is soon to do her magic. 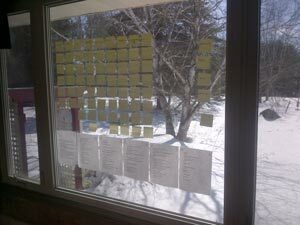 But I can’t bring myself to take all the post-it notes off my window until I officially hit publish in a few weeks. Just in case. Wishing you and your family a wonderful week!